2. 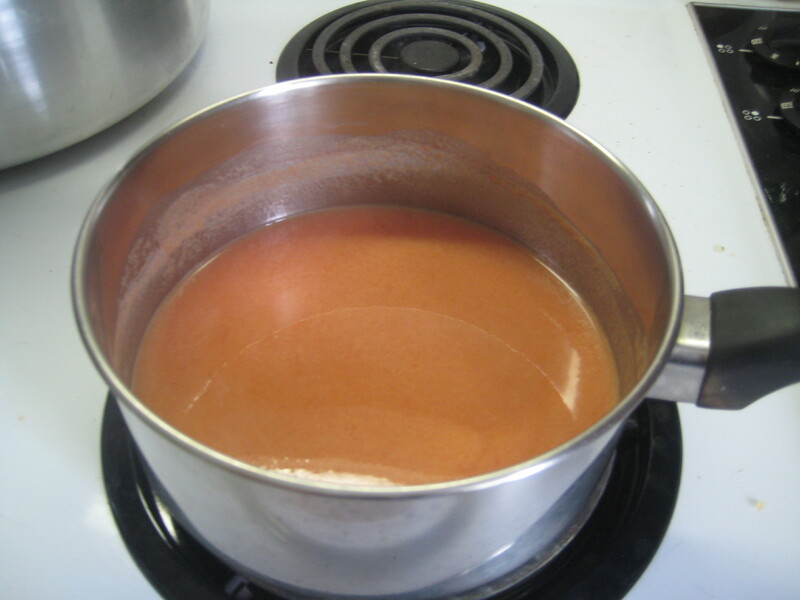 In a large pot of boiling water, working with 6 cups at a time, blanch apple slices for 1 minute. 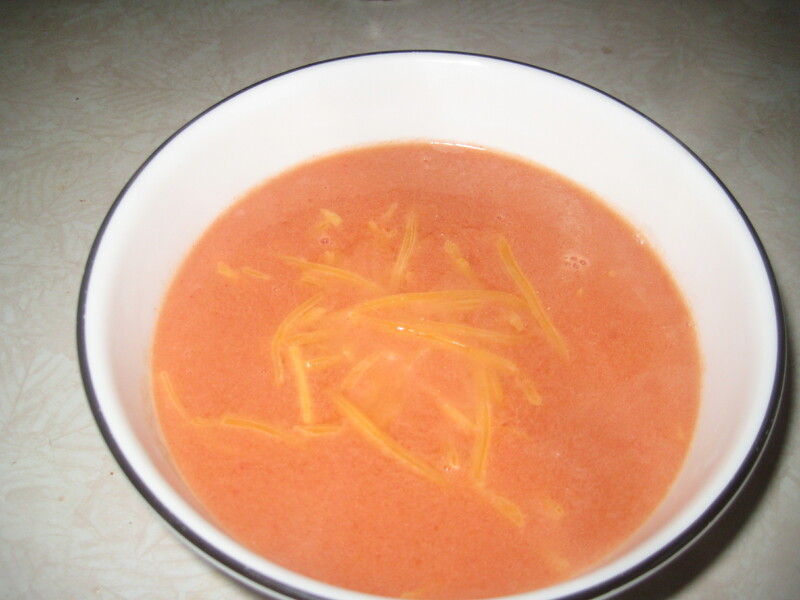 Remove with a slotted spoon and keep warm in a covered bowl. 3. 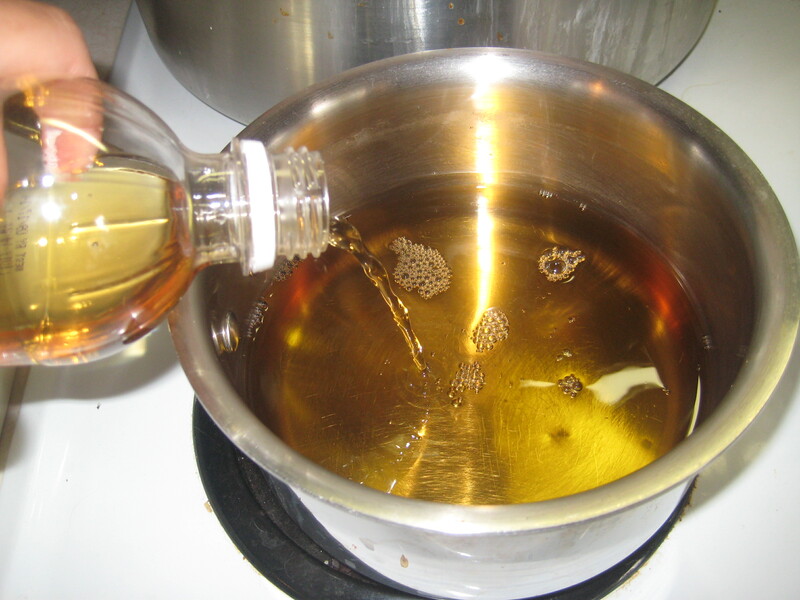 In a large stainless steel saucepan, combine sugar, ClearJel, cinnamon, nutmeg, water and apple juice. 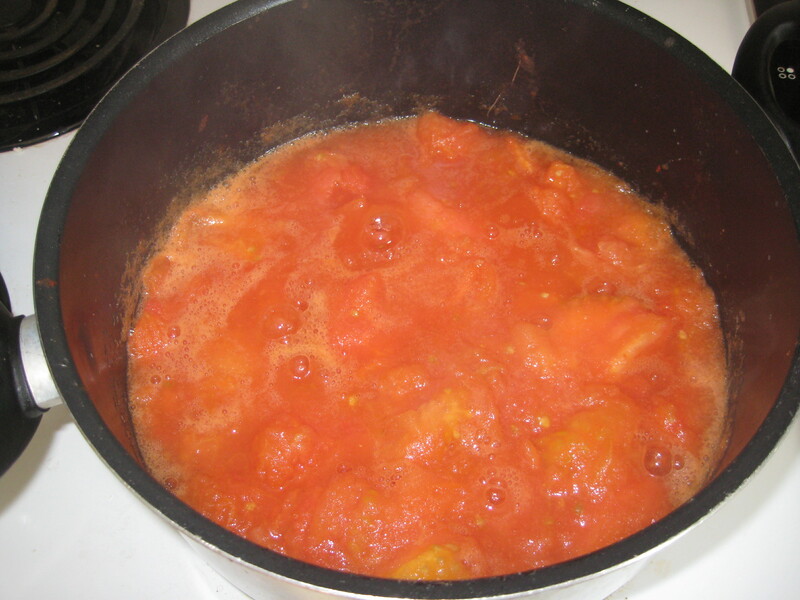 Bring to a boil over medium-high heat, stirring constantly, and cook until mixture thickens and begins to bubble. 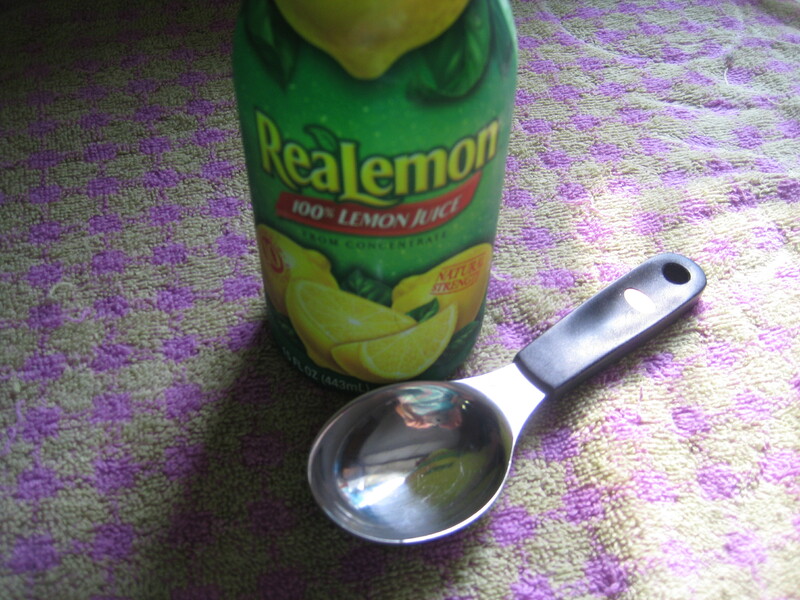 Add lemon juice, return to a boil for 1 minute, stirring constantly. Remove from heat. 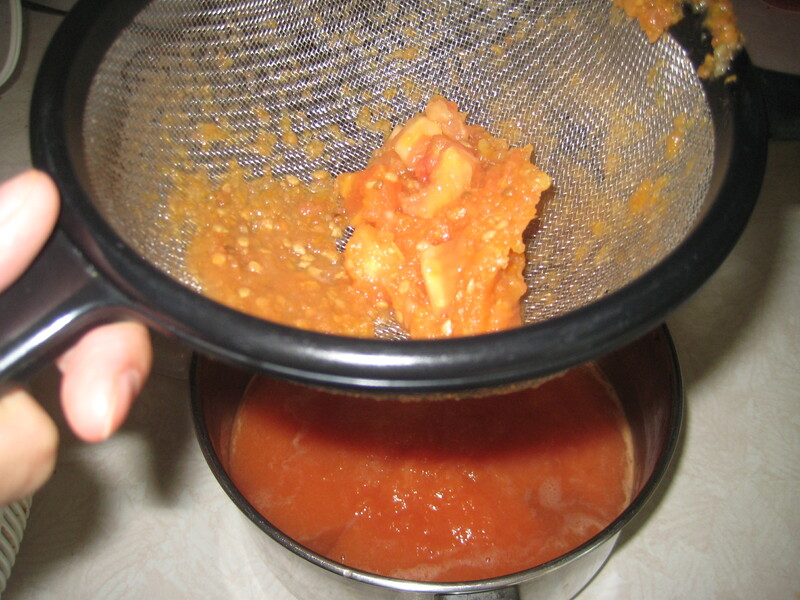 Drain apple slices and immediately fold into hot mixture. 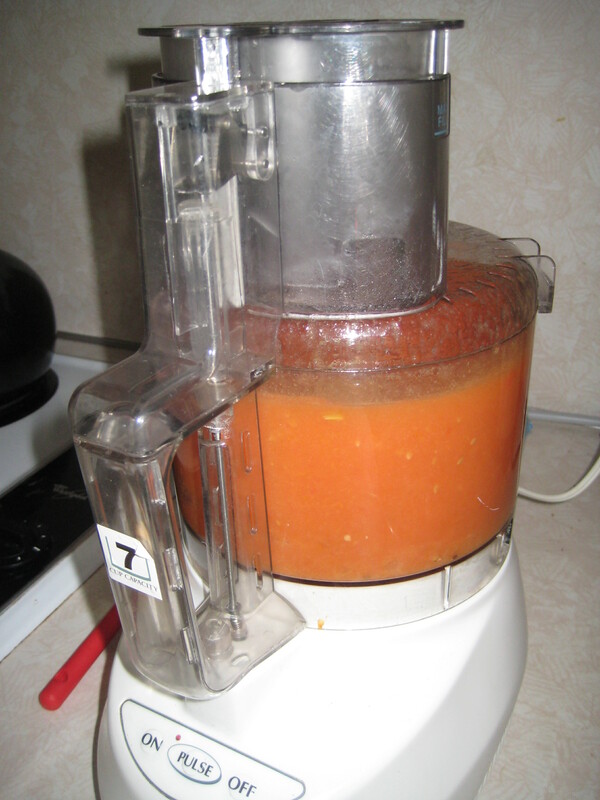 Before processing, heat, stirring, until apples are heated through. 4. Ladle hot pie filling into hot jars, leaving 1 inch headspace. 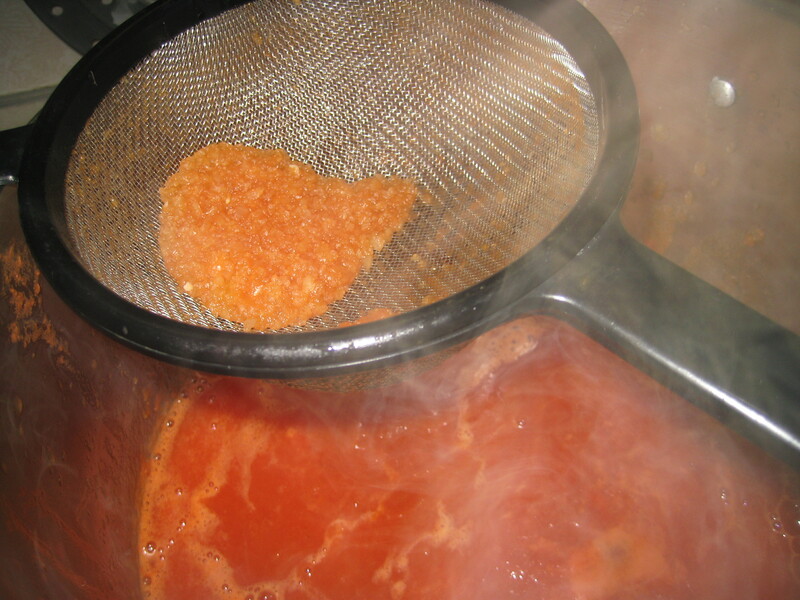 Remove air bubbles and adjust headspace, if necessary, by adding hot filling. Wipe rim. 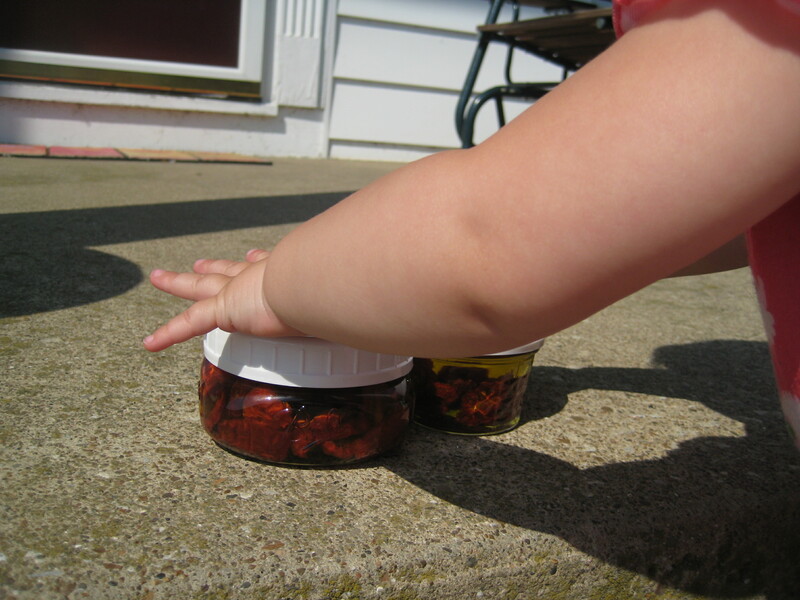 Center lid on jar. Screw band down until resistance is met, then increase to fingertip-tight. 5. 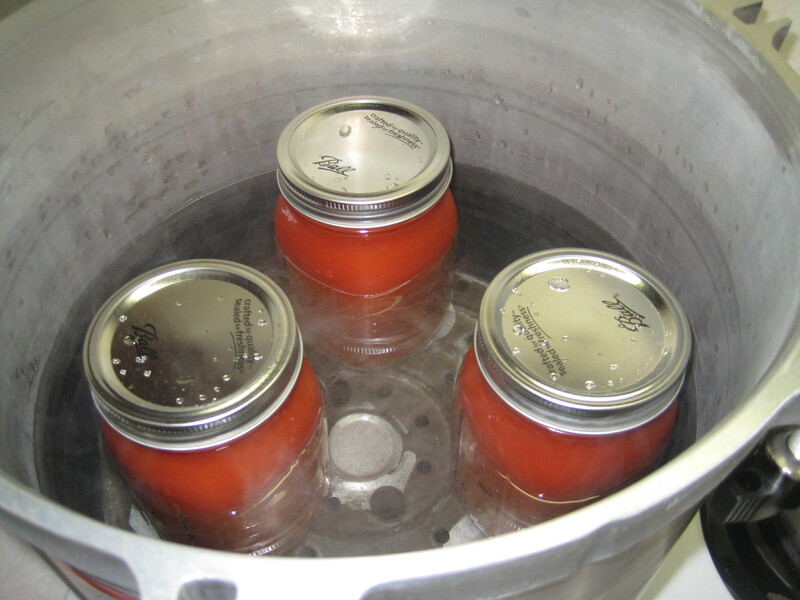 Place jars in canner, ensuring they are completely covered with water. 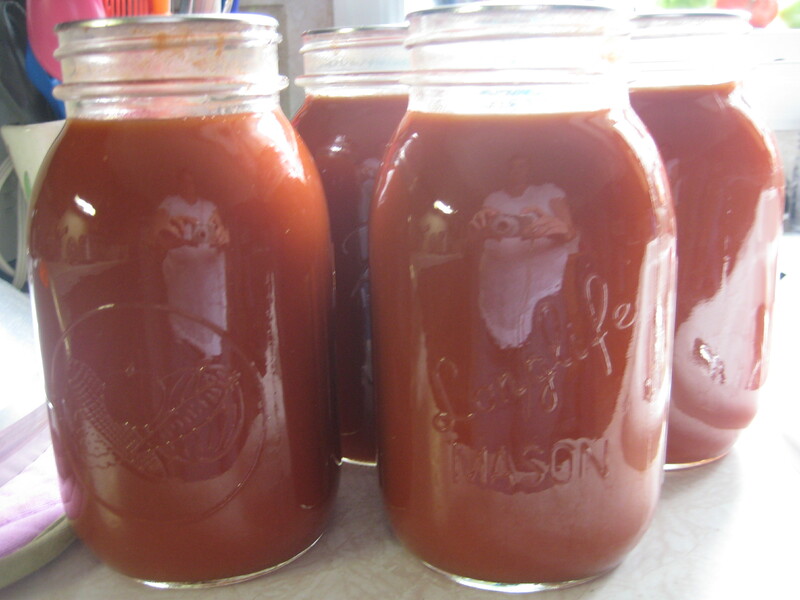 Bring to a boil and process for 25 minutes for pint jars and 35 for quarts. 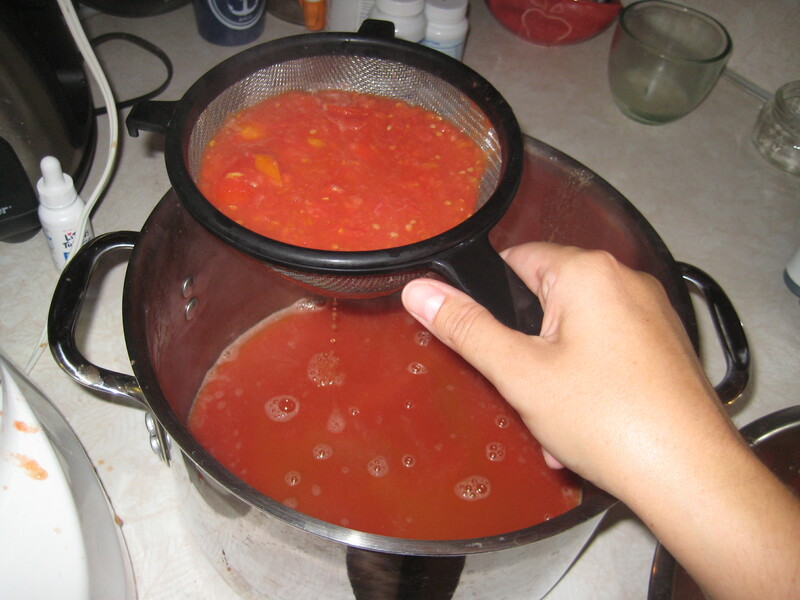 Remove canner lid. 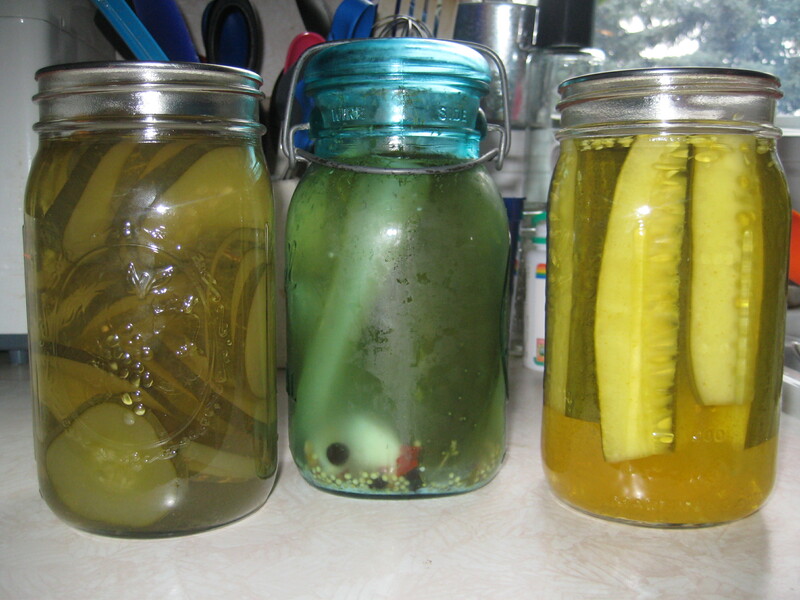 Wait 5 minutes, then remove jars, cool and store. PS. Did you notice my new ladle?? It is so awesome; I am smitten! 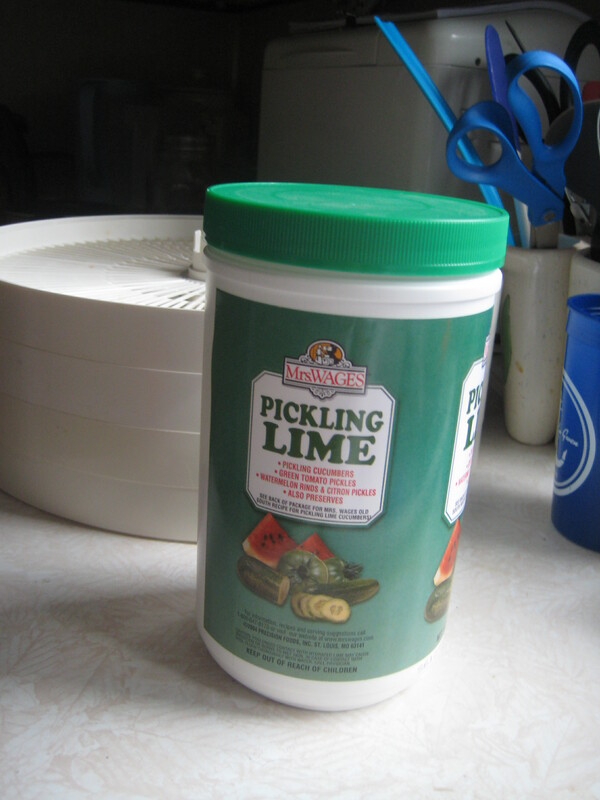 It gets into every nook and cranny of the jar and has made my life just that much easier! I got mine at Meijer, but here’s a link at Amazon if you want to check it out! 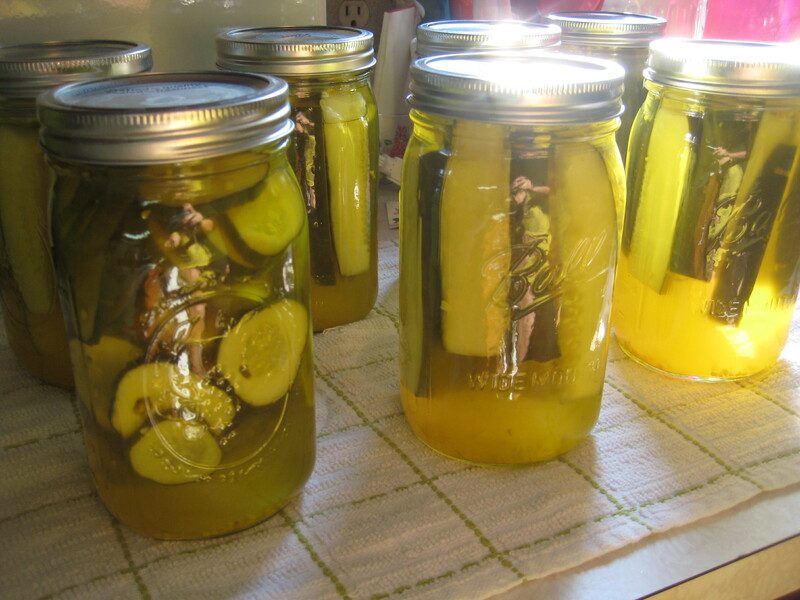 Canning Classes and HOT Pickled Peppers! That’s me in the salmon shirt at the stove. 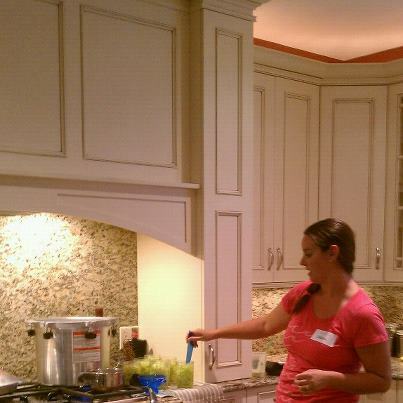 Isn’t my friend Sarah’s kitchen amazing? 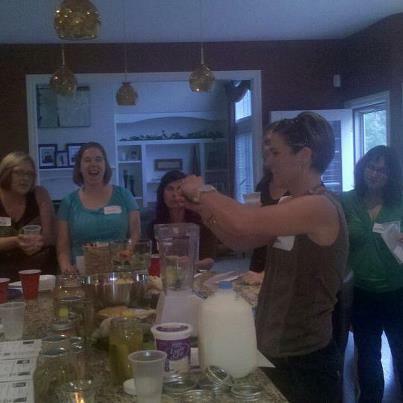 It really was the perfect gathering place for 20+ women. 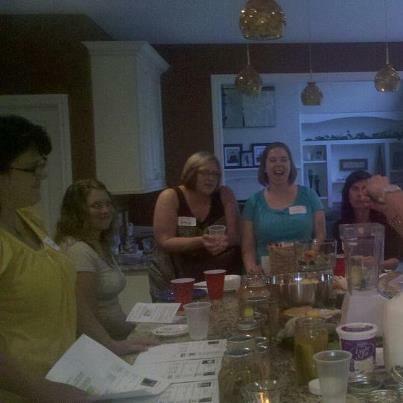 Monday night I was honored to be asked to teach a canning class for my church’s Mom’s Group, MOMentum, at the home of a new friend. I knew about this class several months ago, a fact that did not discourage me from my typical procrastinating style. I started thinking about the class a week in advance, but it wasn’t until about a day before the actual class that I finally decided on WHAT to can! I had to keep it simple since it was an introductory class, I also needed to keep it short since it was an evening class and well, everyone has lives outside of food preservation. Also, my fabulous in-laws gifted me with an entire bowl of what we all thought were banana peppers. 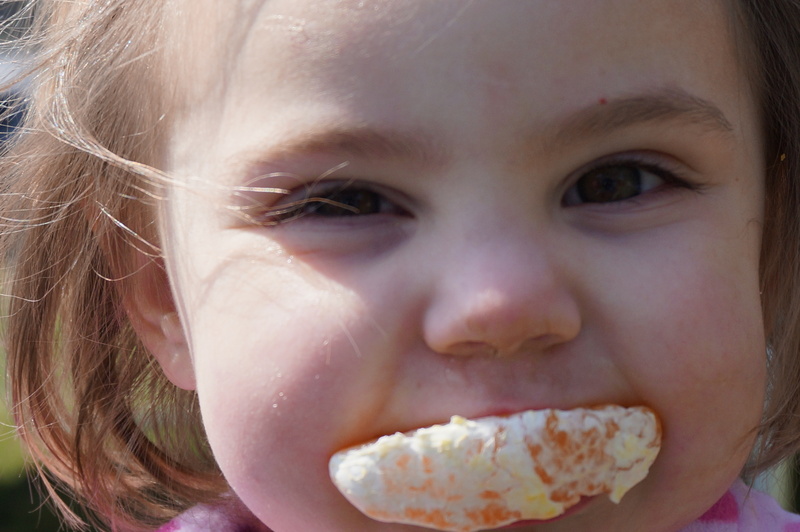 I discovered this honest mistake at the expense of my poor one-year-old’s reaction to chomping down on a pepper ring. I quickly tasted the offending ring and realized that this was no innocent banana pepper! 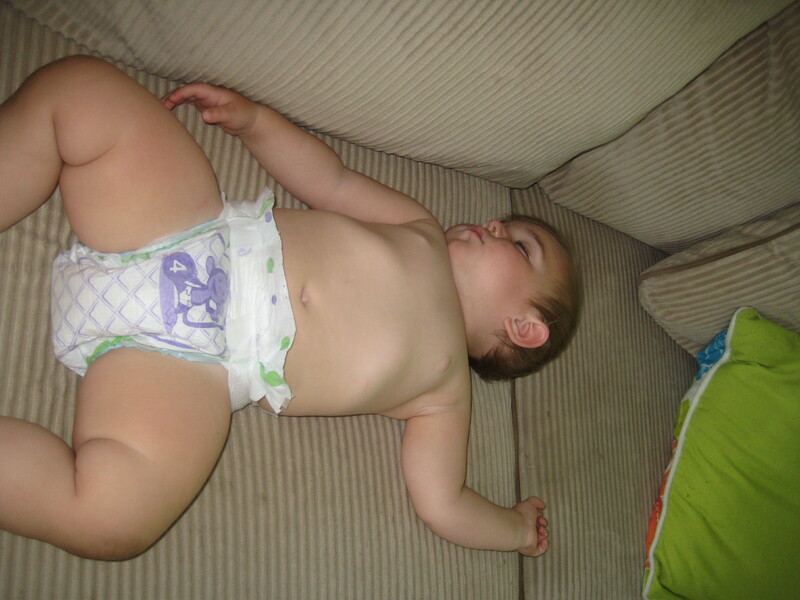 This baby was HOT! And my baby was MAD! I’m pretty sure she’s scarred for life over peppers, and there’s a good chance she’ll never trust me again. Mama duped her, ain’t no two ways about it! Anyway, I digress. So I settled on pickling these spicy peppers since I had them, and also because the recipe is simple, and they only needed to process for 10 minutes. Perfect! I washed and cut them all into rings before the class. I brought samples of everything I have canned this year, which looked kinda cool on my friend’s counter, I have to admit. 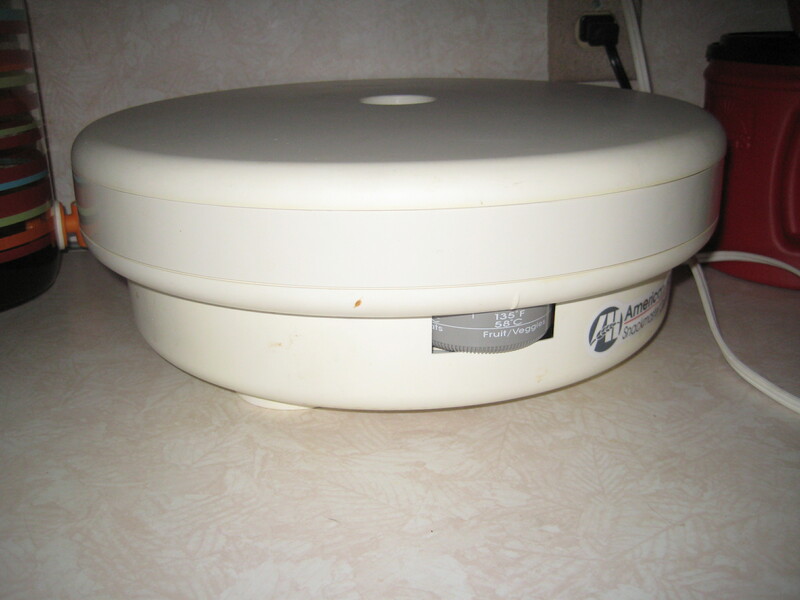 I brought my pressure canner, mostly because I wanted to show it off, but also because I really have no desire to use my “borrowed” boiling-water canner anymore. The pressure canner is taller, and I never have the concern that it will boil over like I did with the boiling-water canner. 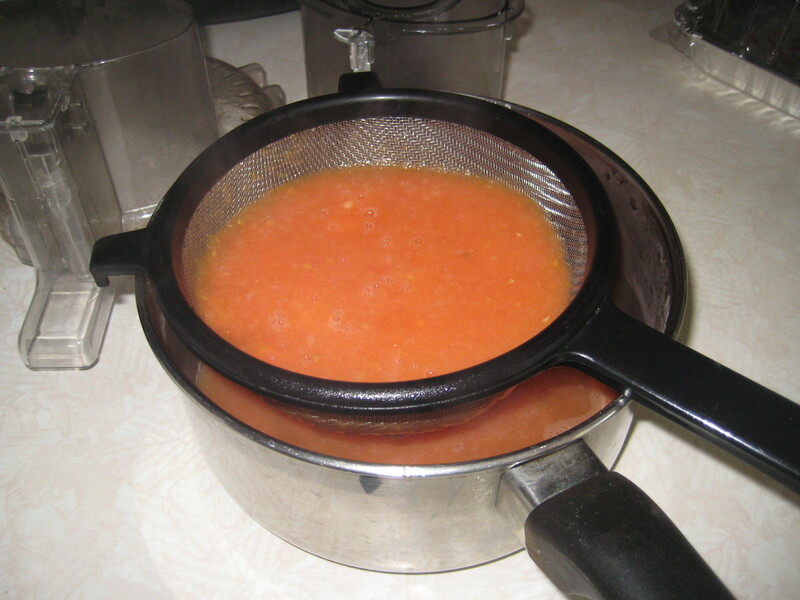 Since I can use my pressure canner AS a boiling-water canner, why not? 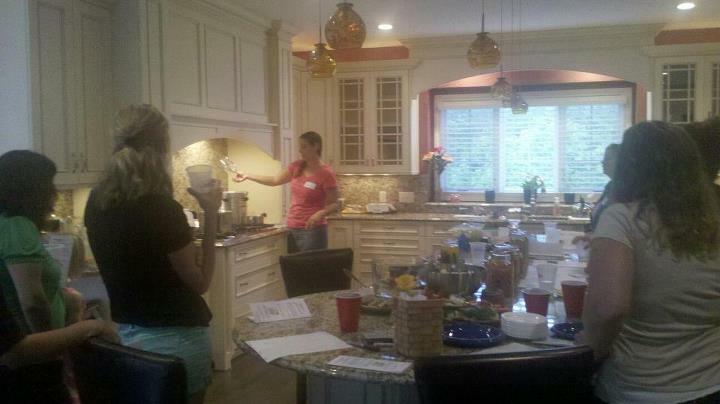 Sarah, our host, teaching us about how to make delicious, healthy smoothies! The class went well! I’m not a natural teacher, despite the fact that I used to be a musical theater actress in high school and college. I get wildly nervous standing on the same floor as my peers, trying to get information from my brain out of my mouth in a coherent manner. Being up on a stage with rehearsed lines… way different. 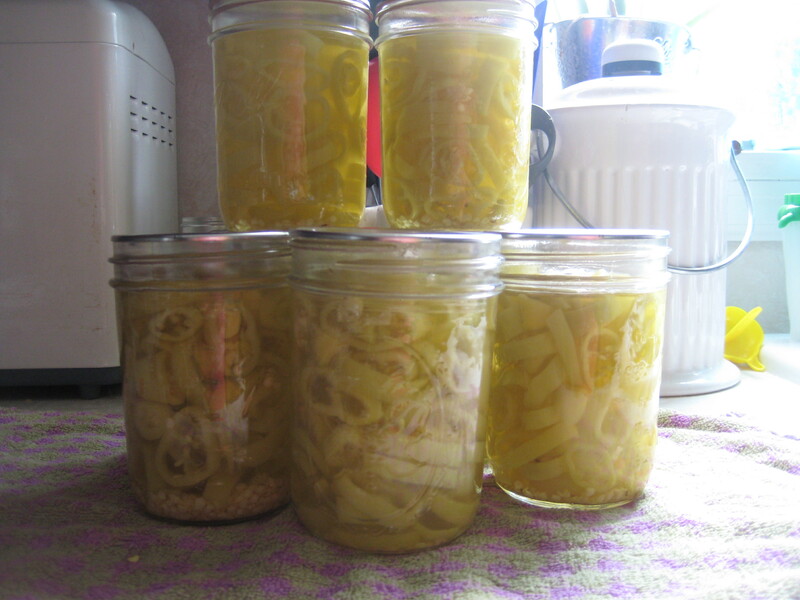 At any rate, we all had a lot of fun, and I think I was able to sputter out the basic steps of canning. 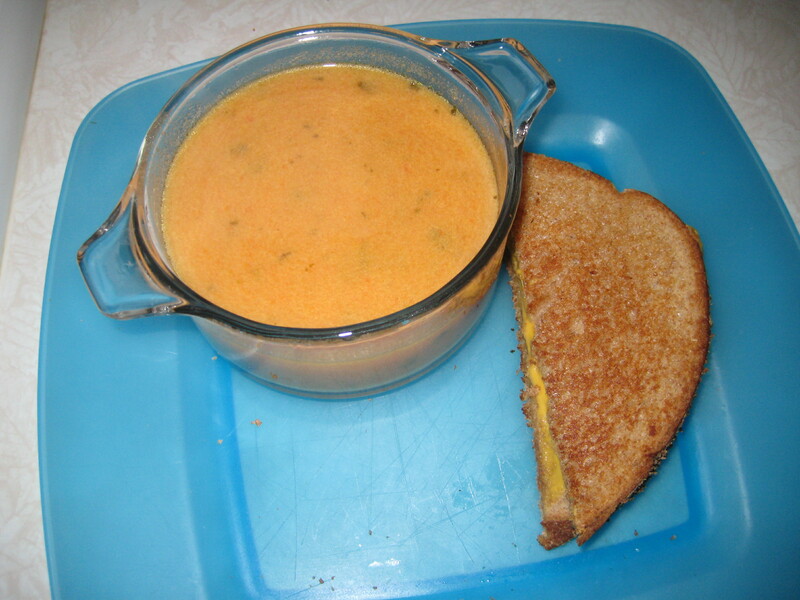 It did occur to me, however, that although the steps are usually included with my recipes in my posts, I really should have a specific page dedicated to them. More harvest posts are coming as well, I have been canning nearly every day for about two weeks and have lots to share with you! 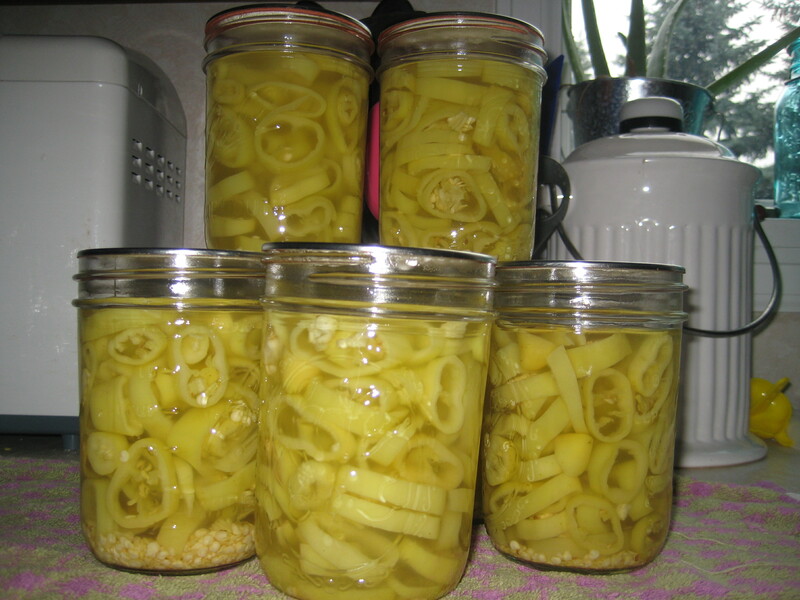 For now, here is the recipe for Hot Pickled Peppers! 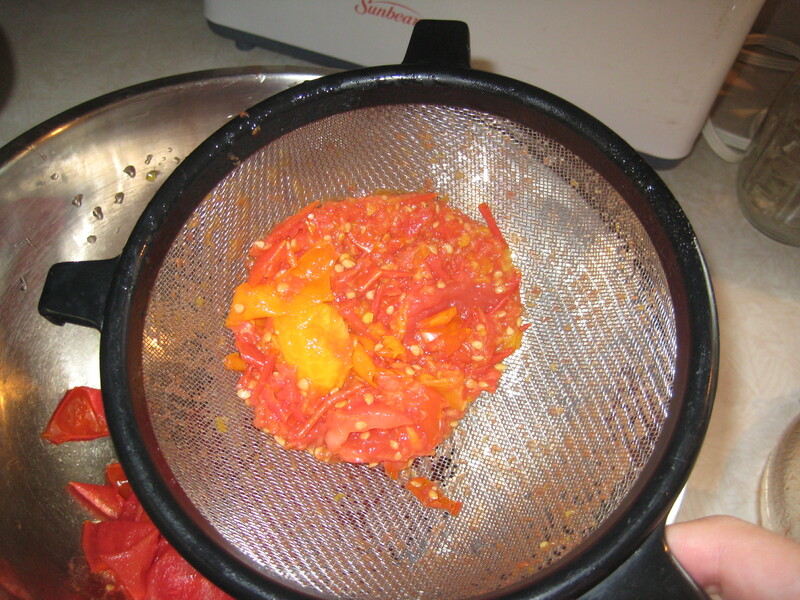 Wash peppers and slice into rings. Consider wearing gloves while doing this step, otherwise avoid touching anything on your face for the rest of the day! 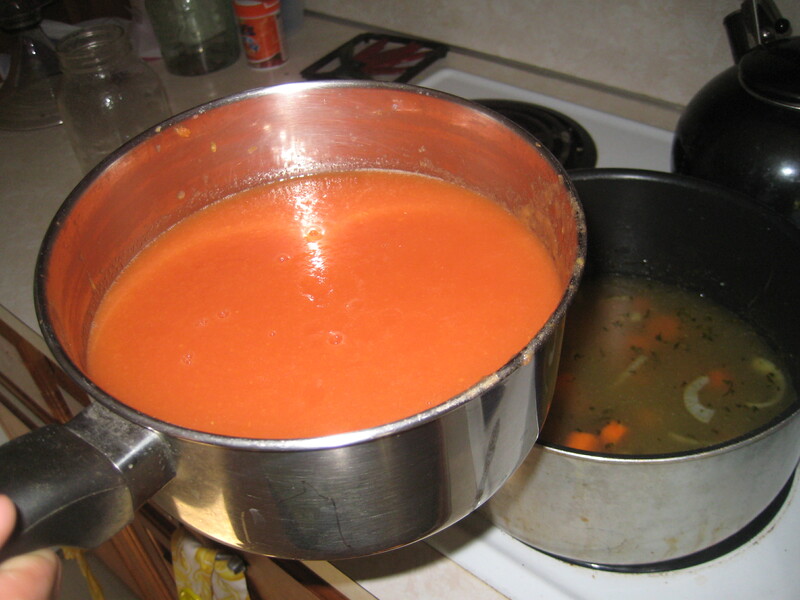 In a large stainless steel saucepan, combine vinegar, water and garlic. Bring to a boil over medium-high heat. 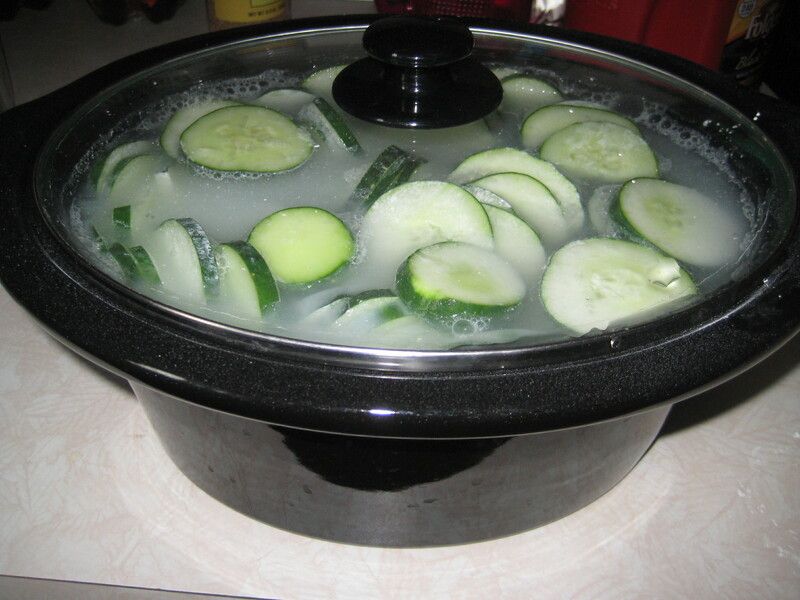 Reduce heat and boil gently for 5 minutes, until garlic flavor has infused the liquid. Discard garlic. 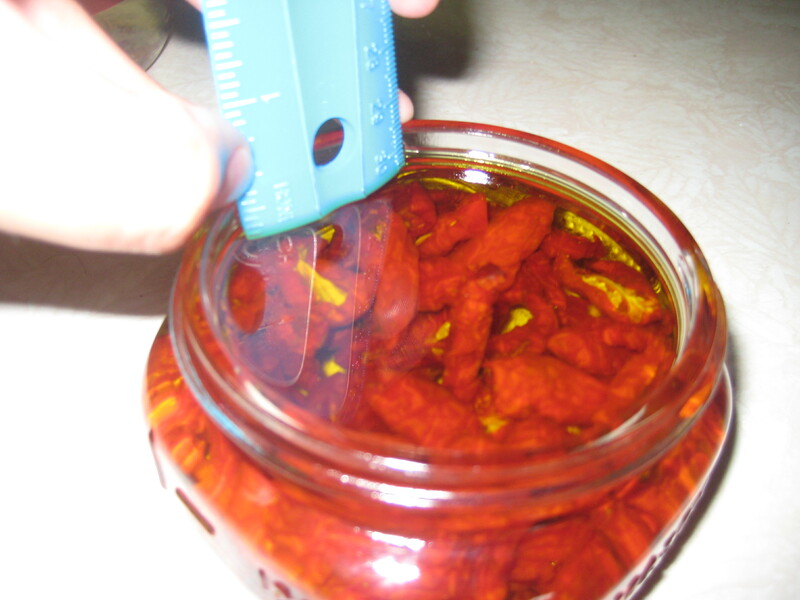 Pack peppers into hot jars to within a generous 1/2 inch (1 cm) headspace. Remove air bubbles and adjust headspace if necessary. Wipe rim, center lid on jar. Fingertip-tighten rings. 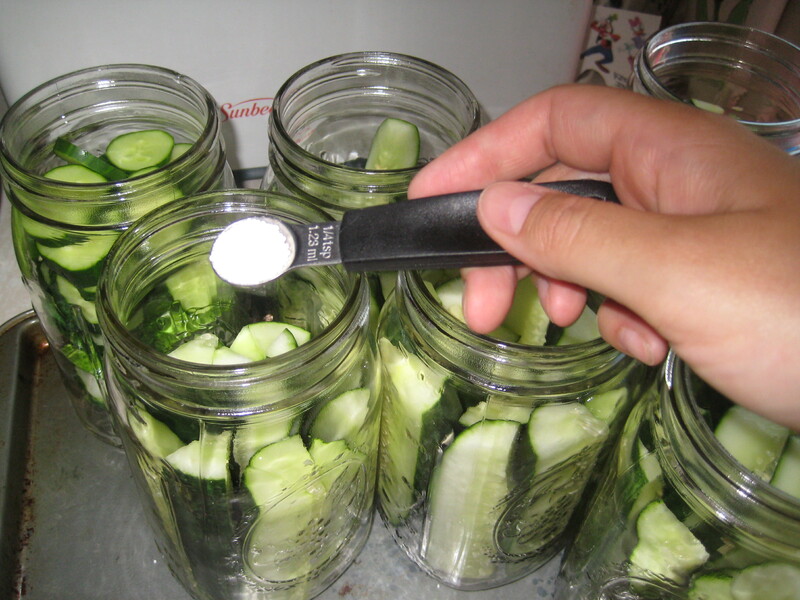 Place jars in canner, ensuring they are covered by water by at least 1 inch. 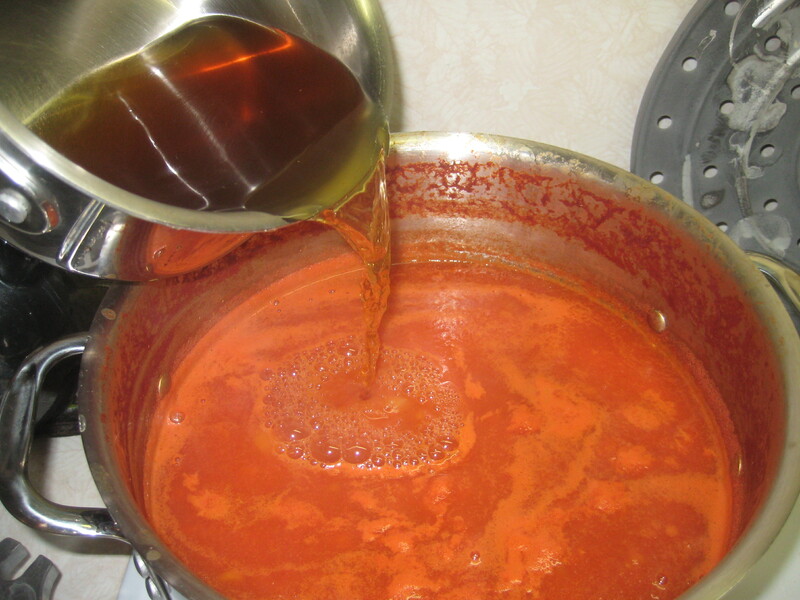 Bring to a boil and process for 10 minutes. 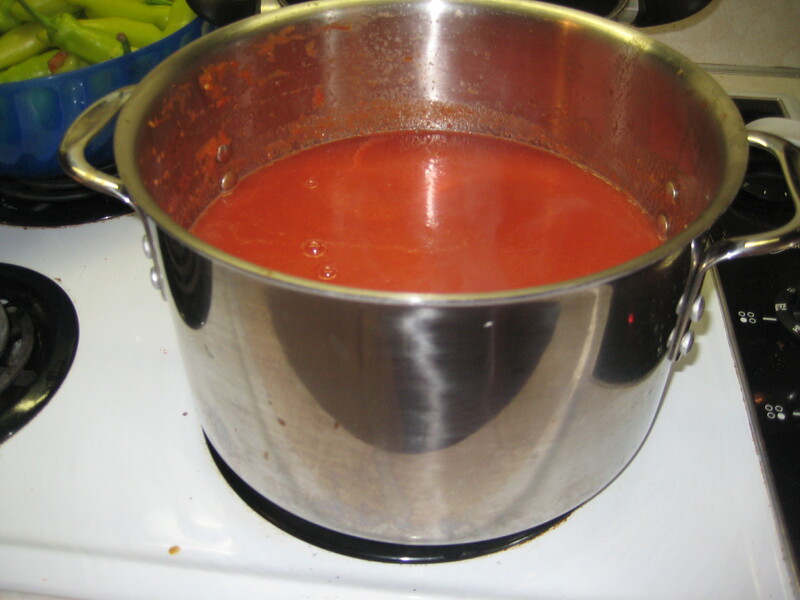 Turn off heat, remove canner lid. 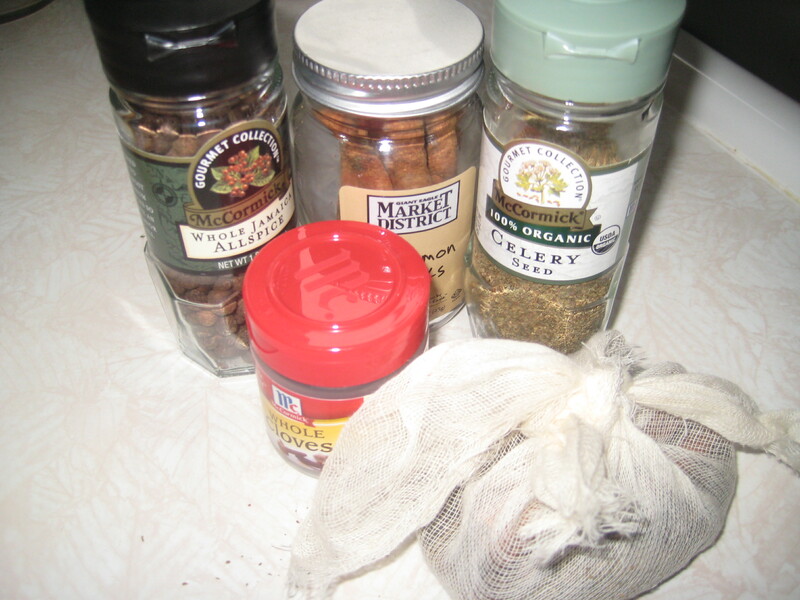 Wait 5 minutes, then remove jars to a towel on the counter, cool, label and store. I stumbled upon a book a few weeks ago that immediately intrigued me. The title alone drew me in: Preserving Food Without Freezing or Canning: Traditional Techniques Using Salt, Oil, Sugar, Alcohol, Vinegar, Drying, Cold Storage, and Lactic Fermentation. I mean, come on, any book that completely summarizes it’s contents within it’s own title has to be a quick, easy read, right? As it turned out, most of the recipes in there were a little far-fetched even for me. It is a pretty interesting book, and I do recommend borrowing a copy from your library. It’s basically a cookbook with a collection of authors almost exclusively from charming French provinces. While I can appreciate the nutrients saved by not subjecting foods to extreme heat or cold to preserve, most of the recipes were obscure enough (chestnuts in vinegar and a bucket?) that I simply couldn’t see myself actually consuming the products. And who has time to put up food they won’t ever eat? 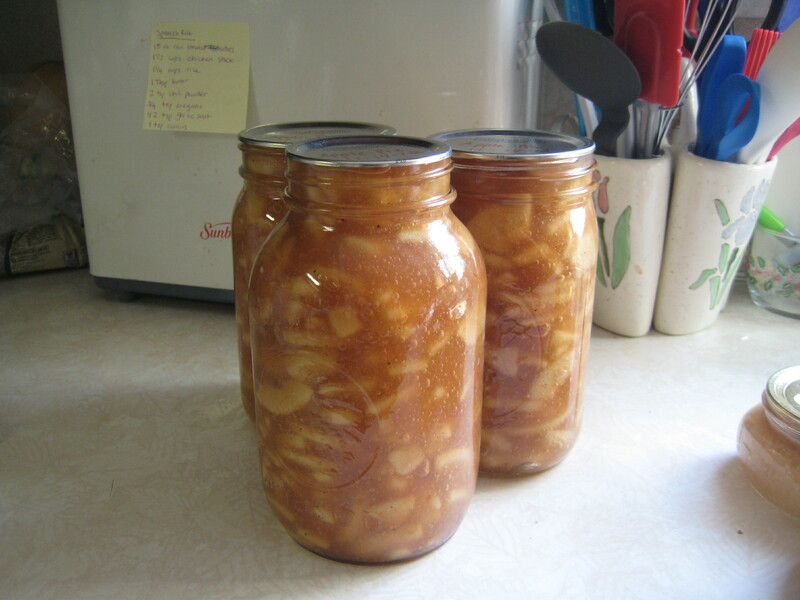 The different methods of preservation NOT involving the ones that are so common and available to us today (canning and freezing) are pretty cool though. 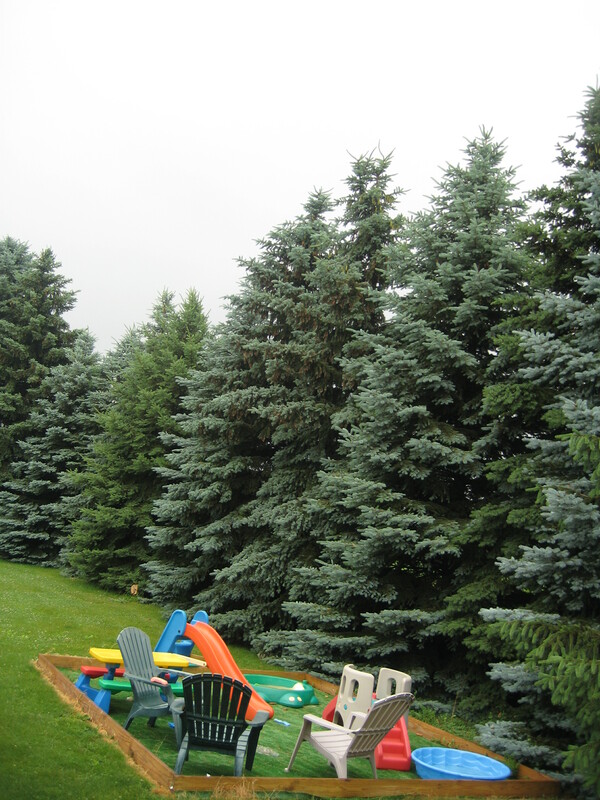 I mean, this is hard-core Prairie Mama stuff, and normally I’d be all over such adventures. But as I said, I just cannot see my my family passing oil-packed cottage cheese that’s been stored in my basement around the table. Ick. There was one recipe I did immediately try, however. 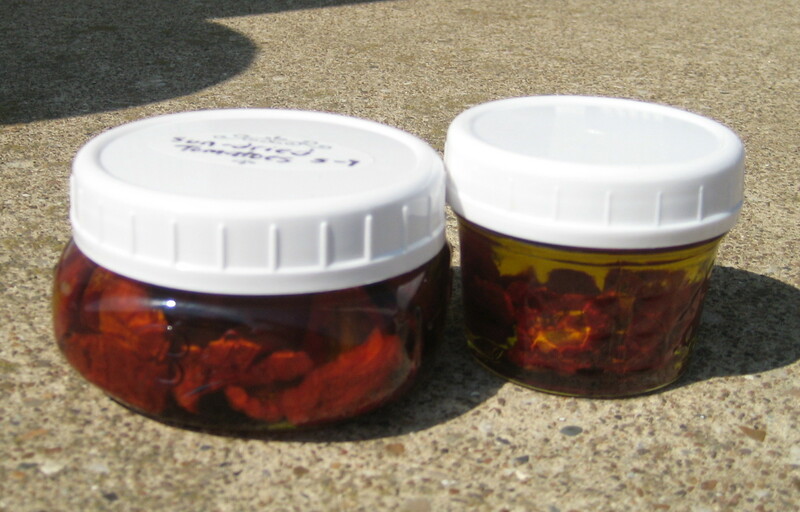 Sun-dried tomatoes packed in oil. Easy-peasy, right? I digress. Let’s get to the point of the post, shall we? Don’t you just want to pinch those sweet chubby thighs? I placed my halves on one of my dehydrator trays, but any platter will work. Next, sprinkle the halves liberally with the salt, cover with the cheesecloth and set in the sun. Yeah, that’s a window screen you are seeing. I didn’t have any cheesecloth and I live out in the middle of nowhere and wasn’t about to drive 30 minutes just to have a classier picture to post. 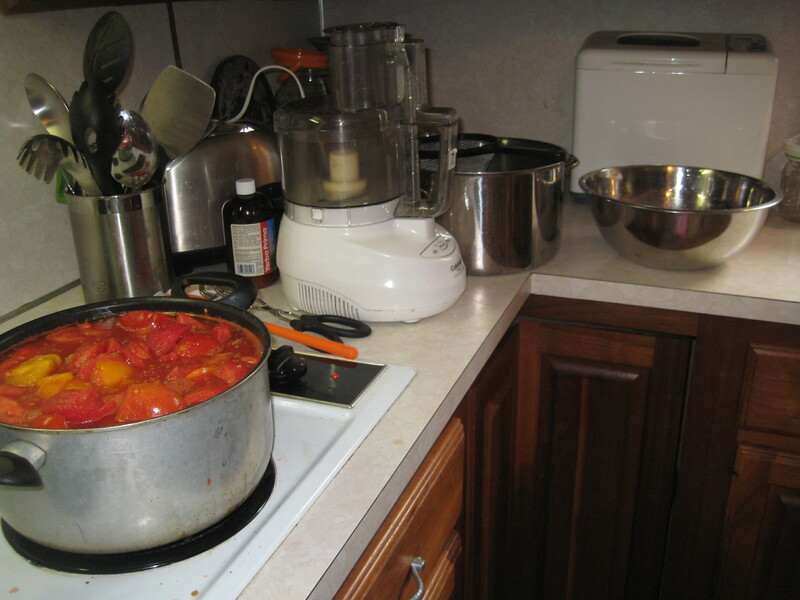 Ok, what really happened was that I assumed I had cheesecloth or at least something that would have worked and went ahead and cut up all the tomatoes and salted them before confirming that fallacy. Can I get some props for creativity? It actually worked to my advantage anyway because we had some pretty intense wind the days I had this outside, and I think it would have created a problem with anything lighter than my window screen. 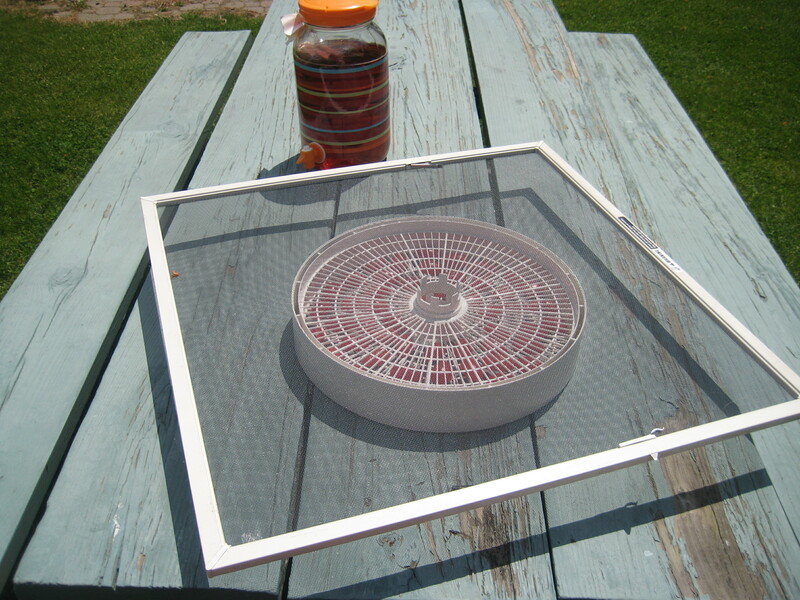 Anyway, this is the tricky part of drying foods in the sun: They actually need to BE IN THE SUN. Not the dark, not the rain, and definitely not the hail. Seems pretty common sense, but common sense and Chelsea Daniels have very little in, well, common. 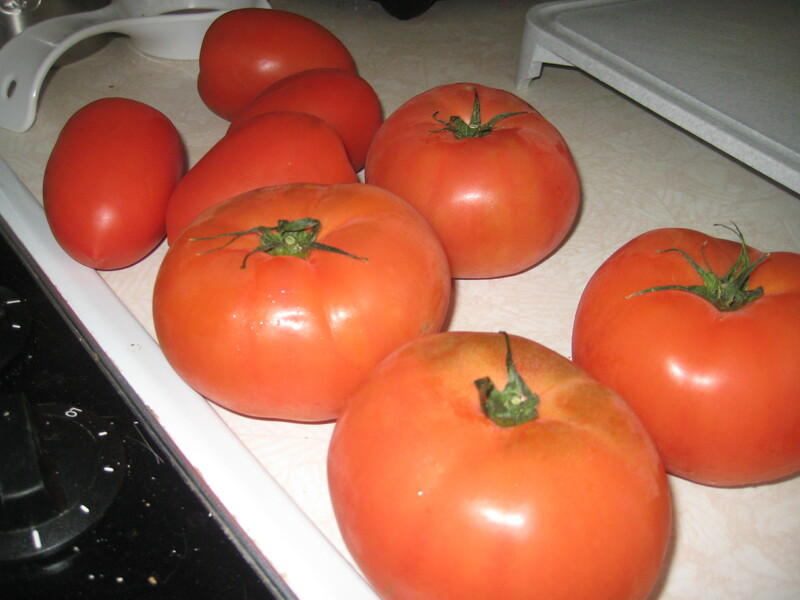 The directions say to turn the tomatoes twice a day and to bring them in at night ‘lest the dew undo the day’s drying. You know what else completely undoes a day of drying? A storm. 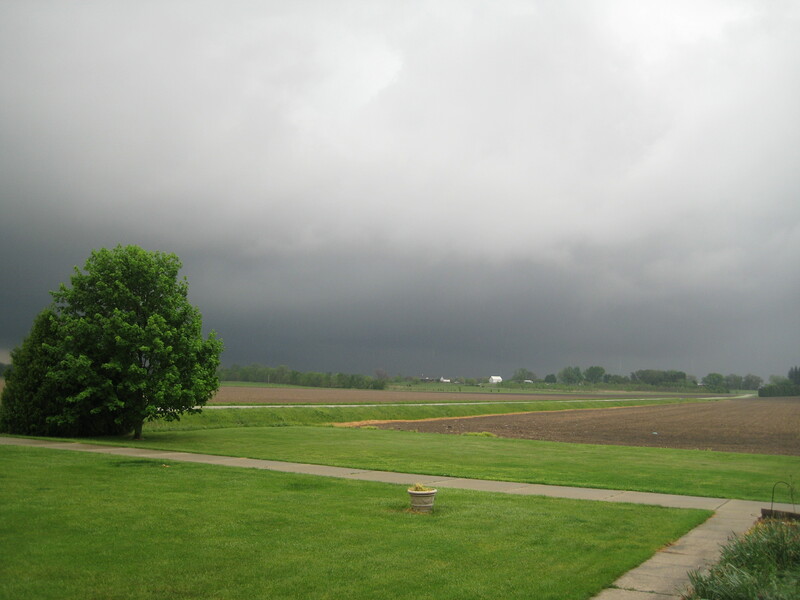 A big, country-style, tornado-looking storm, complete with hail. That’s right. 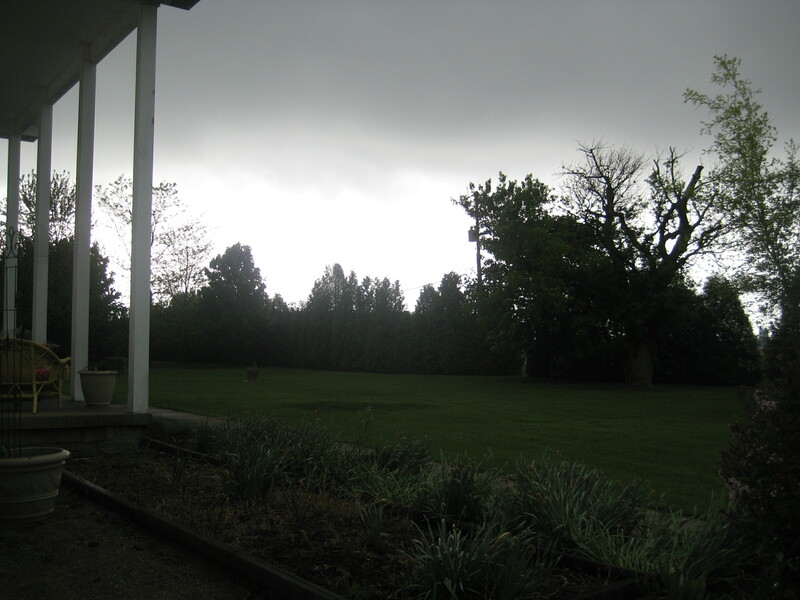 I thought to take pictures of The Storm, but didn’t think to Bring In The Tomatoes. Doh! It’s okay, the next day was sunny and warm. I was kind of starting from scratch again, but by the end of the day they were shriveling nicely. 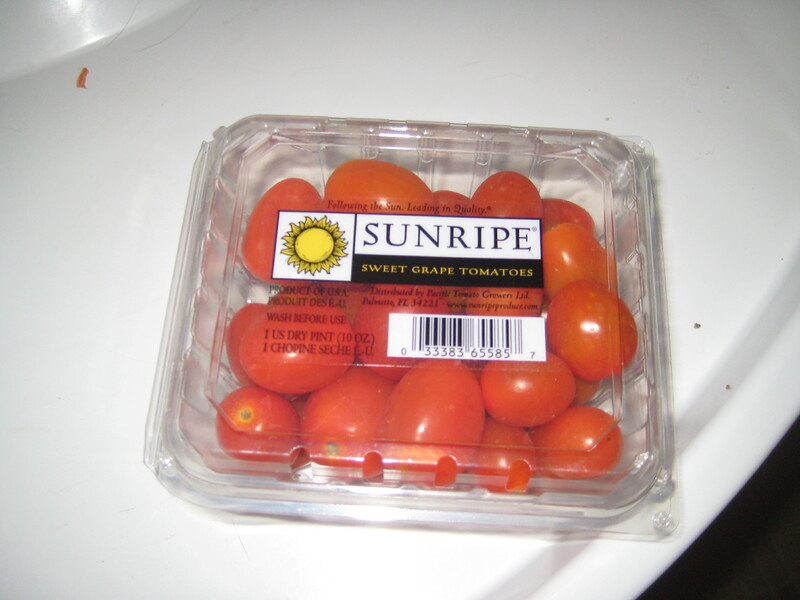 At the start of Day 3, I left to go grocery shopping, remembered my tomatoes and texted my husband (at the store, not on the road 🙂 ) to please set them out in the sun for me. At the start of Day 4, I remembered my tomatoes and realized they spent the night outside. In the dew. Oh, and the rain. Of course. Let’s just skip forward to the “done” part. What should have taken 2, maybe 3 days of attentiveness took ME 7 days. But sun-dry they did finally do, and NOW we get to the true easy-peasy-ness of this recipe. 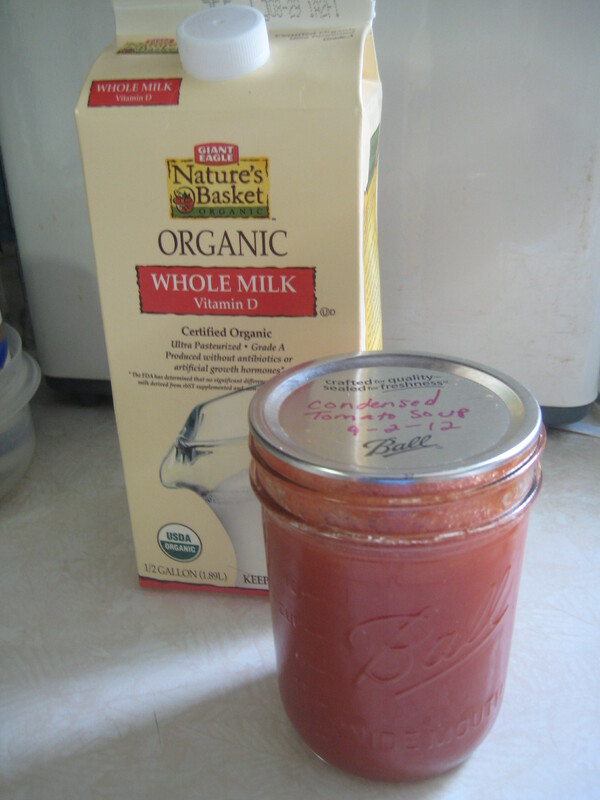 Slap those time-sucking shells of what once ’twere tomatoes into a mason jar, fill it to within 3/8 inch headspace with olive oil, screw the lid on, set it in your pantry and stop wasting any more time on them! Except I couldn’t quit thinking about them. I was irritated that they had proved to be such a task for me, and I was irritated with myself for being irritated. 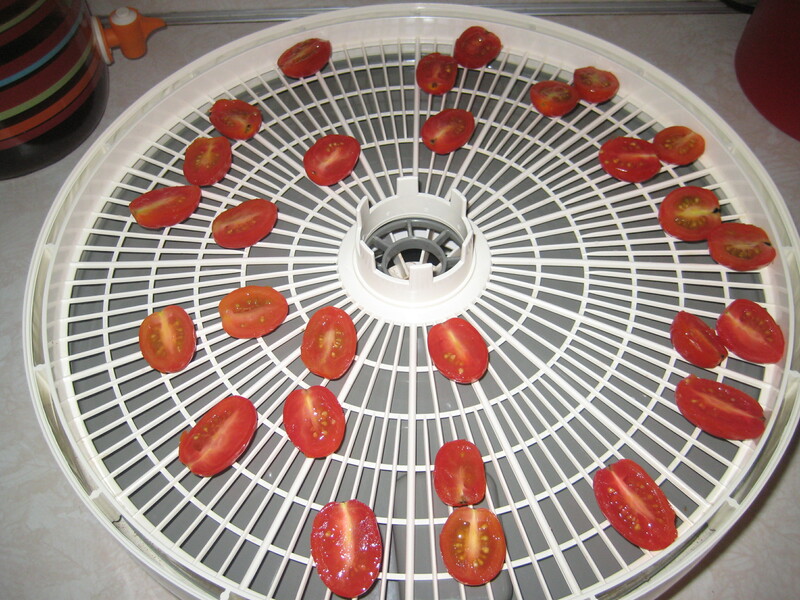 I decided to see if there was any true benefit to sun-drying them as opposed to sticking them in the dehydrator. Do they taste better from the sun? Sun tea does have a slight advantage over stove tea. Suntans have a serious advantage over tanning bed tans. 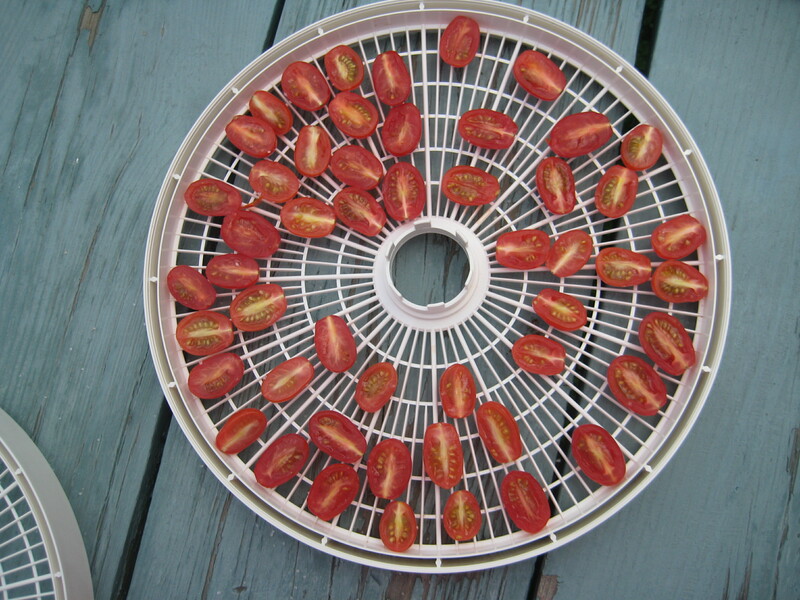 Surely true sun-dried tomatoes have a magic in them that the dried bits from my dehydrator cannot match. This truly is easy-peasy. 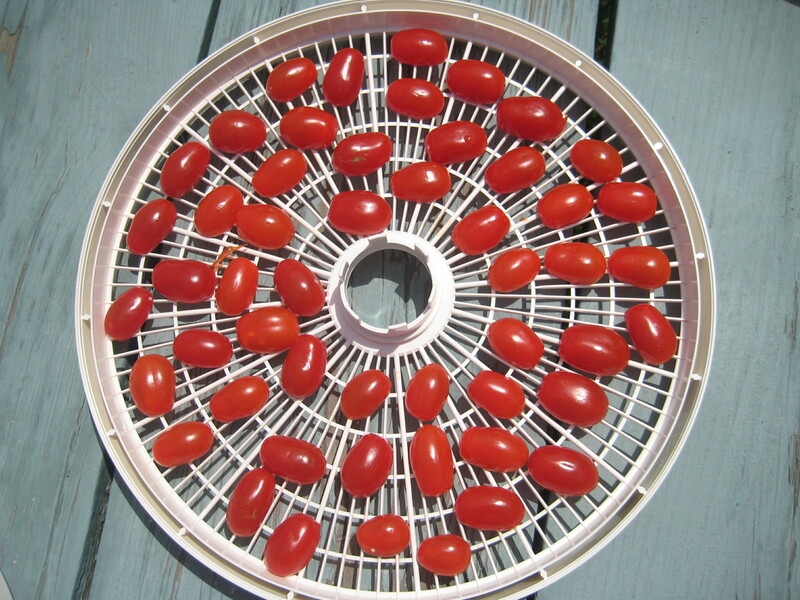 Slice up the tomatoes, lay them on the dehydrator tray, (I only used one tray because we just don’t consume many dried tomatoes) salt them, turn it on the “fruits and vegetables” setting, and in about 6 hours (depending on how packed your dehydrator is) you’ll have dried tomatoes! Pack them in a glass jar with oil to 3/8″ headspace, seal them with a lid tightly, and store in a cool place. If you aren’t as flighty as I am, sun-dried is the way to go. 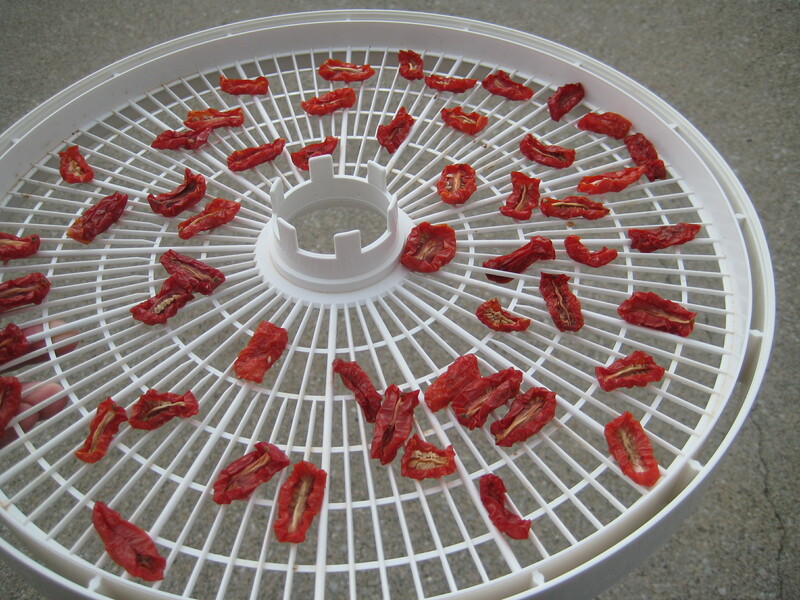 The sun-dried tomatoes had a richer, fuller-bodied flavor than the dehydrated tomatoes. 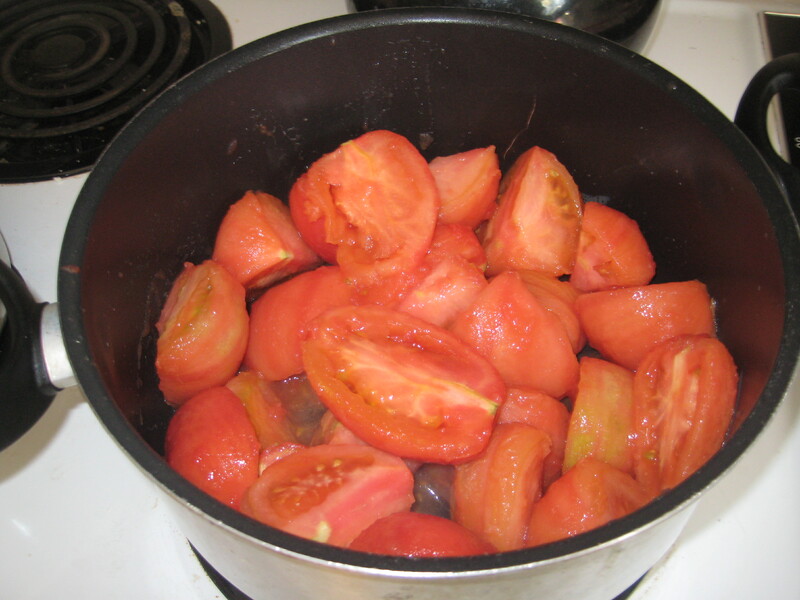 I actually forgot to salt the dehydrated tomatoes (I said I was flighty! 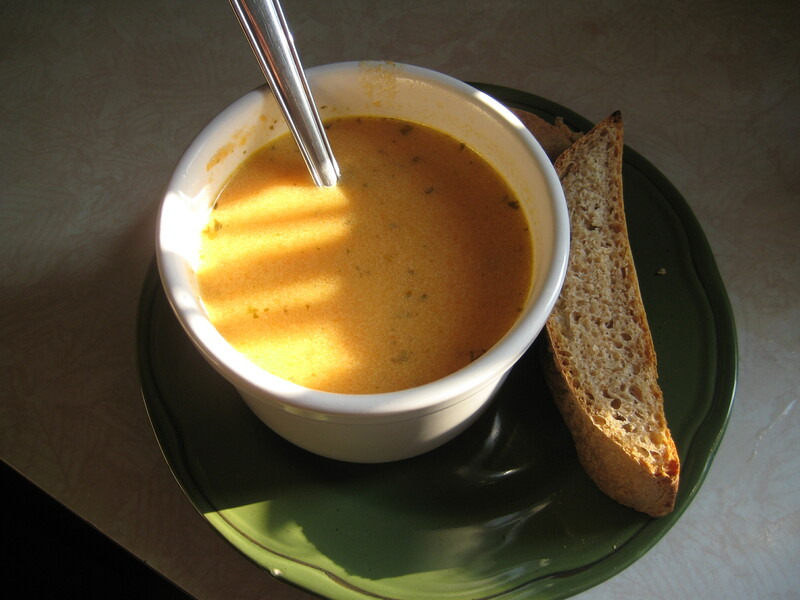 ), too, and the salt on the sun-dried ones was really a nice touch. 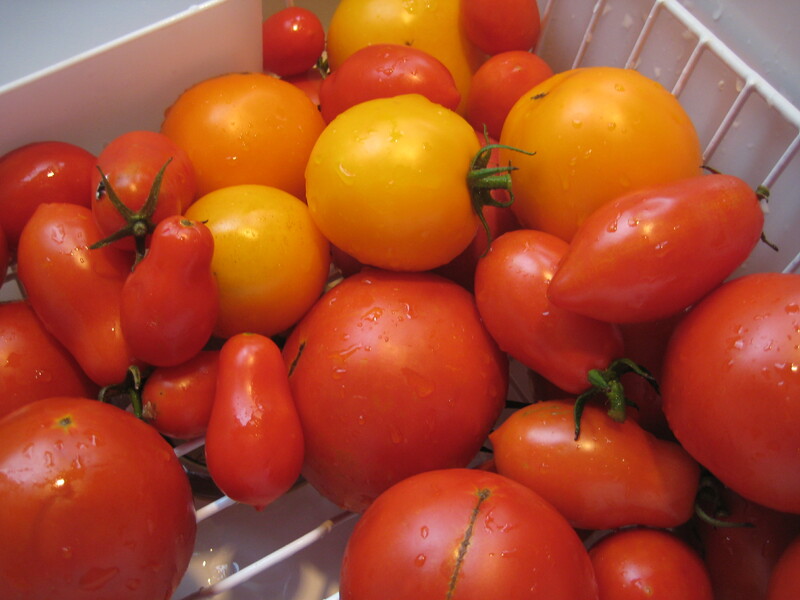 If you are prone to forgetfulness like someone else I know, the good news is that the dehydrated tomatoes are still quite tasty, and absolutely worth it. 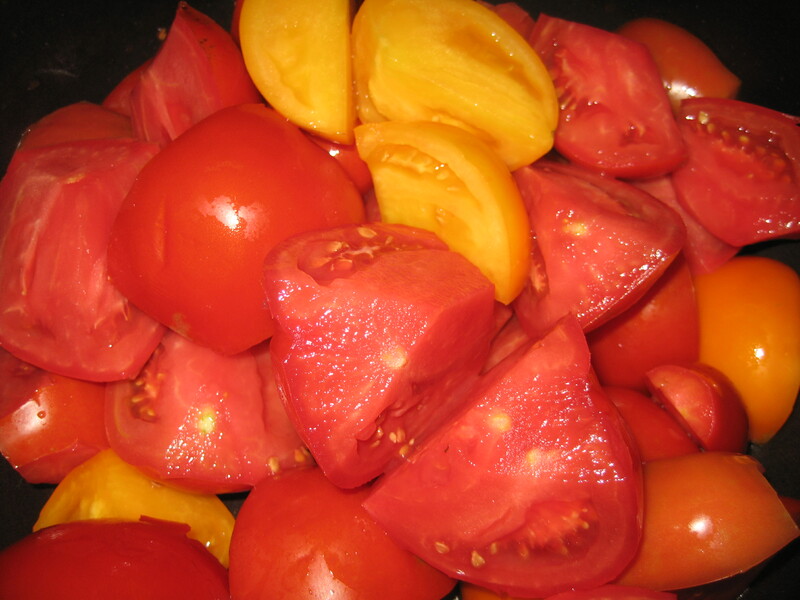 I was pleased to discover that I really liked the oil-packed tomatoes, and can envision myself wrapping them in basil leaves for a snack, or scattering them over a fresh salad. 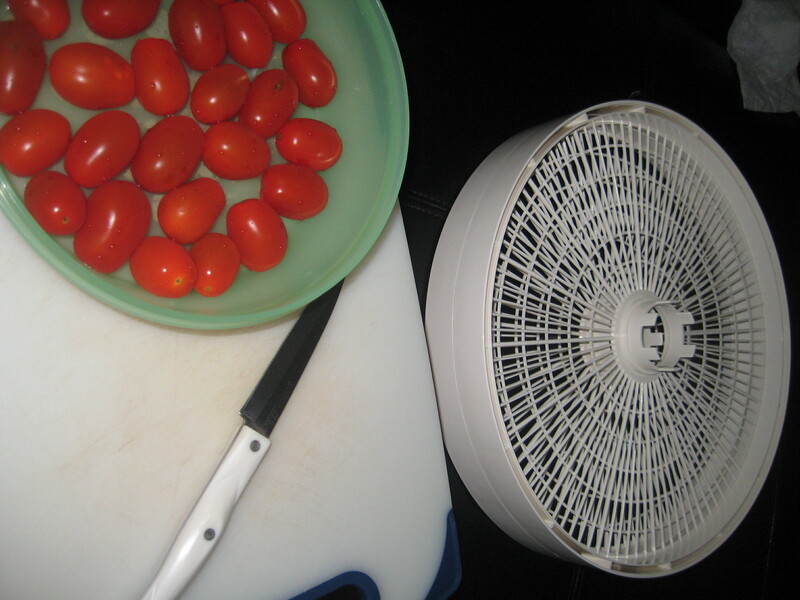 I will be making these again, and I will most definitely be using my ditz-proof dehydrator! Even Dagny wants to try one! 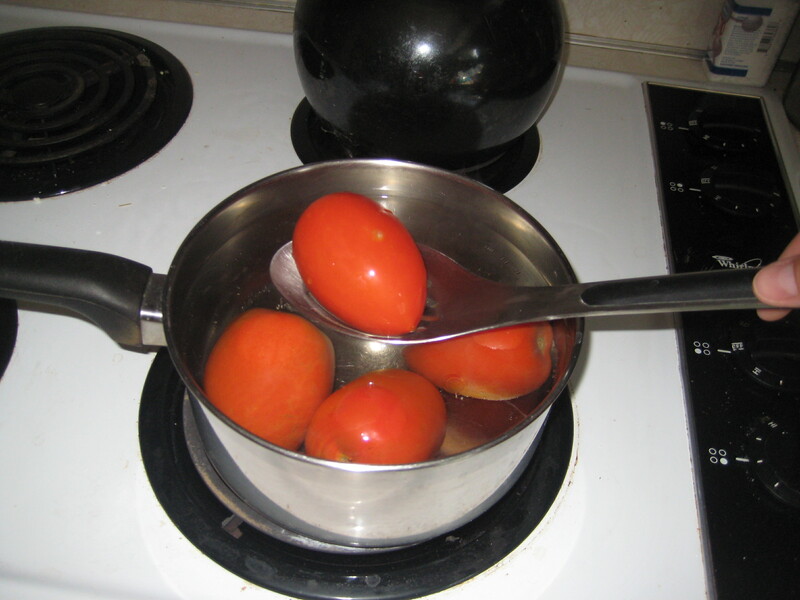 *Note* This recipe did not say how long these tomatoes will last. 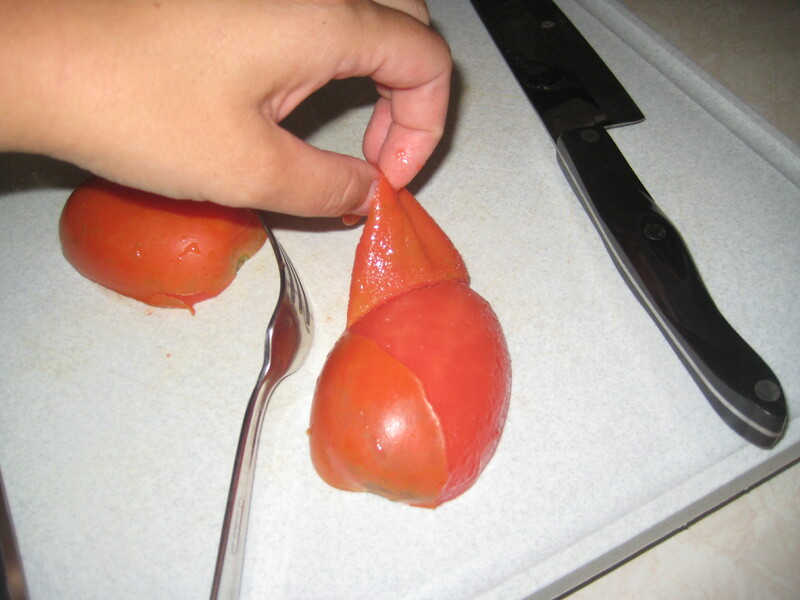 Use your discretion and inspect the tomatoes for any spoilage before consuming.